GO works to bring people together to realize the most effective solutions to ensure educational excellence and equity for Oakland students. 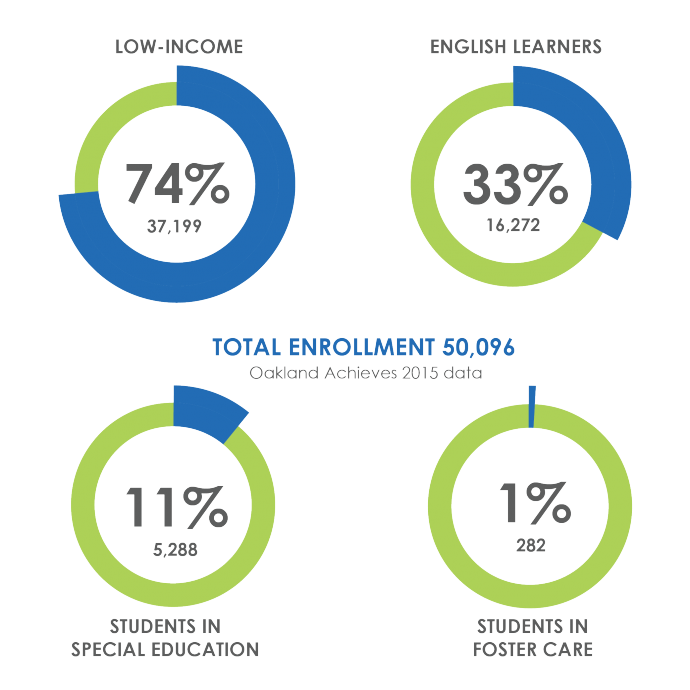 More than 49,000 Oakland students and their families attend a public school in our city, and they are counting on us as a community to help our children achieve their dreams and be prepared for the future. There are many excellent schools in Oakland. Yet equal, excellent educational opportunities are not yet a reality for all of our students. 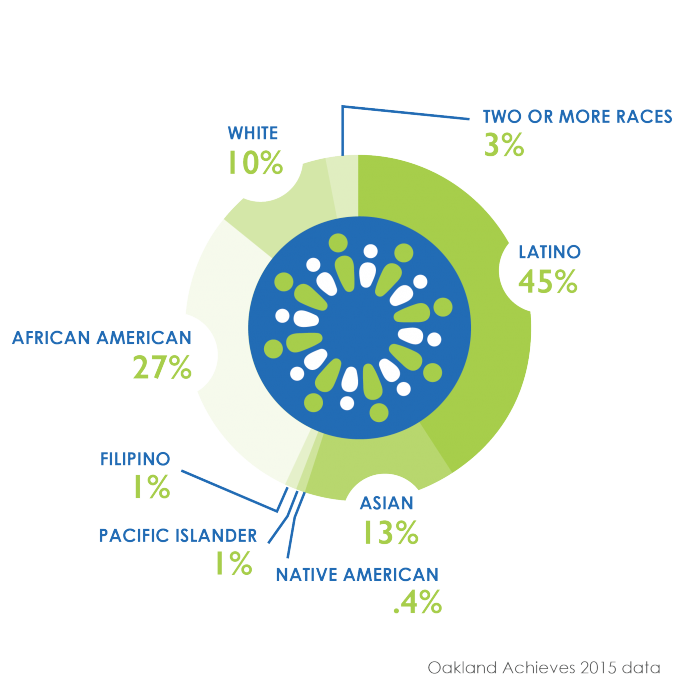 In 2015-16 in Oakland Unified, according to district data, 75 percent of white students graduated high school on time, yet only 59 percent of African American students graduated high school on time, and 55 percent of Latino students graduated high school on time. In addition, white students are nine times more likely than African-American students and 18 times more likely than Latino students to attend a high-quality district school. Our network is driven by the urgent needs of children and families for an excellent education — especially those most at risk of missing out. GO connects Oaklanders to public education policy and decision-making via our community engagements (endorsement process, volunteer opportunities, and meetings) and through our online communications ( email newsletters, social media, and web site). More than 6,800 subscribers receive monthly email newsletters. Since 2009, our Board Agenda Watch newsletter has previewed and explained board meeting agendas, putting a spotlight on board activities and making board members more accountable to our community. In the 2012, GO and its community partners and allies endorsed three Oakland Unified School District (OUSD) school board candidates who aligned with our values. All three won seats on the board. Additionally, the organization backed Measure J, a successful local bond to improve school facilities. We rely on our community of families, educators, and community members to help us endorse candidates and issues during Oakland’s election season. Our work continued in 2014 with four candidate endorsements and support for Measure N.
Since our launch in 2009, GO Public Schools Oakland has connected the public to education by informing and empowering community members about district and school policies and practices through communications and events. Our first campaigns focused on keeping budget cuts as far away from students and classrooms as possible and pushing back on school closure plans focused only on school size and without any community engagement. Read more about our history. Learn more about our organization in Frequently Asked Questions. View our most recent 990 to learn about our finances. Every child in Oakland receives a quality education to fully participate and succeed in life and work in the twenty-first century. GO Public Schools Oakland Advocates unites and supports a community of students, families, educators, and allies committed to working together to generate solutions that ensure every Oakland student thrives.